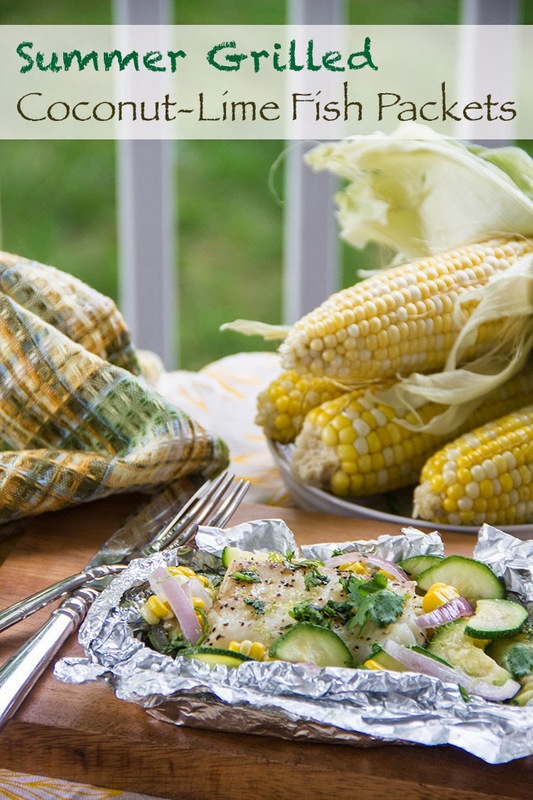 Arrange equal amounts of the corn, shallot, garlic, and zucchini in the center of the right half of each piece of foil, near the foil line. Fold up the sides of the right half of the foil, creating a "bowl" that contains the vegetable. To each packet add: 1 1/2 Tablespoons of EVOO or canola oil, 1/2 cup of light coconut milk, 1/2 Tablespoon of lime zest. Using clean hands, mix to combine ingredients. Place te packets right side up(with the fish on top) on a baking sheet and set the baking sheet on the grill. Bake for about 8-10 minutes and then use a spatula to flip each packet. Cook for 8-10 more minutes. Use kitchen shears or a knife to cut a slit through the top center of each packet to fold open. Open carefully - the steam that will rise from each packet is very hot. Check to be sure the fish is opaque and cooked through the center. If fish is not cooked through, place back on the baking sheet and grill for 8-10 minutes more. Top the fish and veggies with freshly chopped cilantro.